StoGuard® functions as an air barrier component and secondary water-resistive barrier in wall assemblies. Sto DrainScreen functions as a wall cavity drainage component. The secondary moisture protection provided by StoGuard protects walls against moisture damage from rain during the construction process and in the event of incidental water intrusion following the completion of construction. Sto DrainScreen promotes drainage and drying. 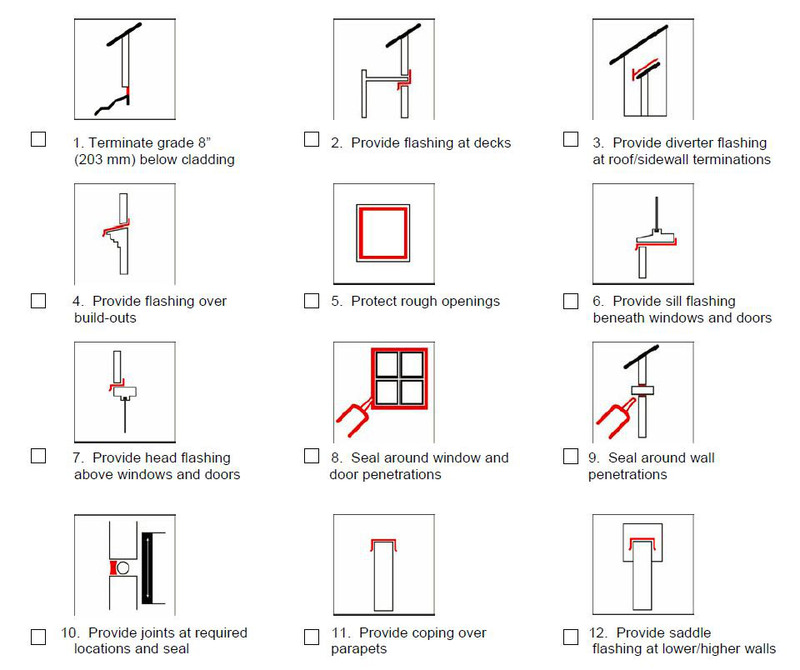 These components are not intended to correct faulty design or workmanship such as the absence or improper integration of flashing in the wall assembly, nor are they intended to correct defective components of construction such as windows that leak into the wall assembly. Flashing must always be integrated with the WRB (water-resistive barrier) in the wall assembly, particularly at potential leak sources such as windows. ADDITIONAL COMPONENTS SUCH AS CODE COMPLIANT BUILDING PAPER OR FELT MAY BE NECESSARY WHEN DESIGNING WITH POROUS CLADDINGS SUCH AS STUCCO AND STONE VENEERS OVER LATH, PARTICULARLY IN MOIST, MARINE, AND HOT AND HUMID CLIMATE ZONES. For complete information on recommended assemblies incorporating StoGuard® and Sto DrainScreen refer to details at www.stocorp.com. Water intrusion into wall assemblies has become a growing concern in the construction industry. Yet water intrusion can be prevented simply by following sound construction practices as illustrated below. StoGuard® can make it easier to follow these practices. Add another layer of protection to your walls with Sto DrainScreen drainage mat. Sto DrainScreen is a drainage mat between the cladding and the StoGuard® fully adhered air and moisture barrier. Should water reach the back of the cladding, it can drain from the wall assembly via the drainage mat, which also helps speed the drying. Drainage and drying can be particularly important in hot and humid climates and in areas with wind-driven rain. Promotes drainage and drying in stucco, cement board stucco, stone, siding and thin-brick veneer wall assemblies. Water vapor moves freely through the drainage mat layer. Easy to handle, carry and roll onto the wall. This product is intended for use by qualified professional contractors, not consumers, as a component of a larger construction assembly as specified by a qualified design professional, general contract or builder. It should be installed in accordance with those specifications and Sto's instructions. Sto Corp. disclaims all, and assumes no, liability for on-site inspections, for its products applied improperly, or by unqualified persons or entities, or as part of an improperly designed or constructed building, for the nonperformance of adjacent building components or assemblies, or for other construction activities beyond Sto's control. Improper use of this product or use as part of an improperly designed or constructed larger assembly or building may result in serious damage to this product, and to the structure of the building or its components. STO CORP. DISCLAIMS ALL WARRANTIES EXPRESSED OR IMPLIED EXCEPT FOR EXPLICIT LIMITED WRITTEN WARRANTIES ISSUED TO AND ACCEPTED BY BUILDING OWNERS IN ACCORDANCE WITH STO'S WARRANTY PROGRAMS WHICH ARE SUBJECT TO CHANGE FROM TIME TO TIME. For the fullest, most current information on proper application, clean-up, mixing and other specifications and warranties, cautions and disclaimers, please refer to the Sto Corp. website www.stocorp.com.